A Scottish council has become the first to award babies certificates to encourage pride in their home city. Aberdeen City Council has started to issue the free civic pride certificates to parents of city newborns. The awards will be presented along with birth certificates when babies are registered in Aberdeen. On the certificate, Lord Provost John Reynolds writes: "It is my sincere hope that you will always take pride in the city of your birth." The certificates, the first of their kind to be issued in Scotland, are intended as a keepsake for parents, and the children themselves in future years. The Lord Provost said: "We know that people born in Aberdeen and those, like myself, who have chosen to come here to live and work feel a strong emotional attachment to the city. "The certificate is one way of articulating that sentiment on paper and encouraging everyone to value their citizenship and take a lifelong civic pride in the city." The gold-bordered awards feature a short message saying: "As Lord Provost of the City of Aberdeen it is my pleasure to welcome the birth of a new citizen of Aberdeen. "The city values each and every one of its citizens and it is my sincere hope that you will always take pride in the city of your birth." Chief registrar Dennis Stuart said: "The attractive new certificates are a welcome addition to the service we provide to the public. "We hope it will prove to be a popular memento for parents marking the occasion of registering a birth. "We should emphasise, however, that the certificate is intended only as an extra souvenir and cannot be used for any legal purposes." 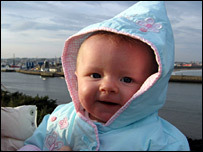 There were 2,449 births registered in Aberdeen in 2005. The vast majority were born in the city itself.